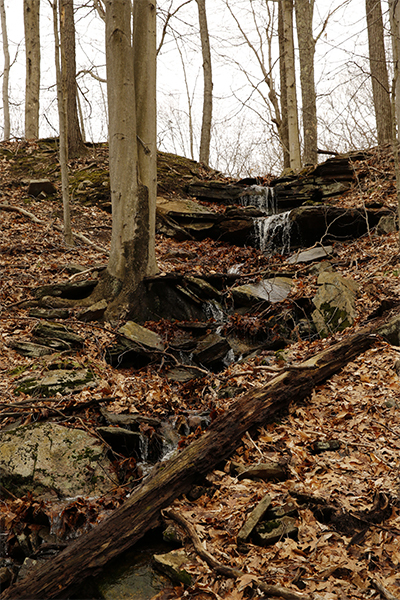 If it weren't for the two exceptionally cool rock shelters on this hiking loop, I never would have bothered to document this "waterfall" on this website. I visited the falls during the spring thaw of 2017 and find only dabbles of water. Frankly put, I couldn't have been more disappointed by the falls. 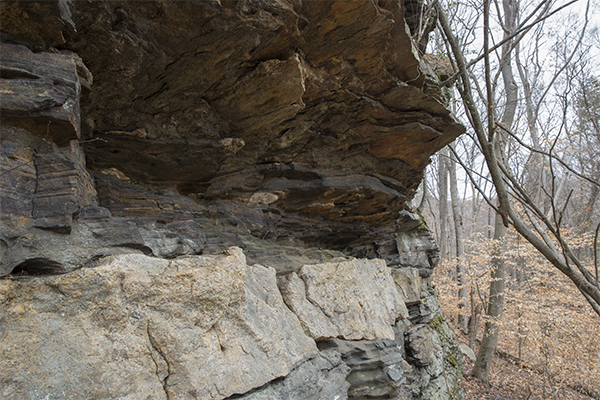 The rock shelters, on the other hand, were some of the most interesting geologic features I have found in Connecticut. Both are believed to have provided much-needed winter shelter for the Hammonasset tribe in the past. The protection from the elements within these shelters must have been substantial, and climbing into them is now pure fun, especially for children. From the parking area, hop over the guardrail and hike downhill on the obvious trail. After only 50 feet from the trailhead, decide which way you want to complete the loop: clockwise or counterclockwise. Both directions are blue-blazed and are also guided by small arrows attached to trees. It really doesn't matter which way you do the loop; the important thing is to do the entire thing since the falls are near the mid-point. Let's assume you left (clockwise). You'll pass directly by the first and most impressive of two indian rock shelters in 0.4 mile. 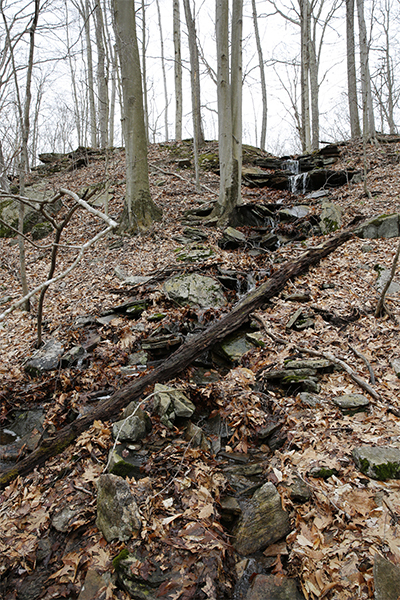 You'll reach the falls after 0.7 mile, and they will be clearly visible on your left only feet from the trail. If water conditions are low, you may not even realize this is an actual waterfall. At 0.8 mile, you'll pass by the second and less impressive rock shelter. 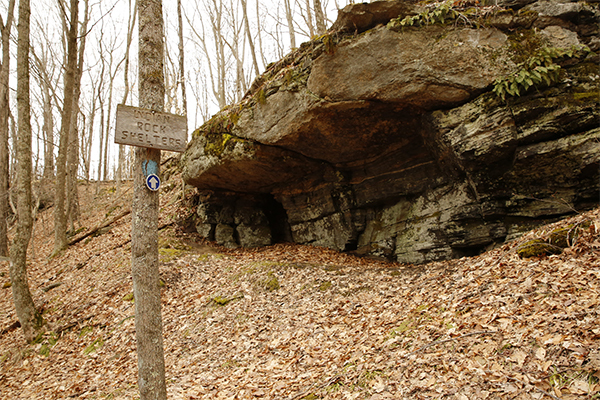 Continue hiking beyond the second rock shelter and you'll cross a brook 0.9 mile into the loop. Continue for 0.3 mile further and you'll return to the original loop junction that is 50 feet from the trailhead. Take note that the entire loop is well-marked but on my visit in April 2017 it could have used a little bit of trail maintenance as some spots some brush growing in. From the traffic circle junction of CT 79 and CT 80 in the section of Madison known as North Madison, take CT 80 east for 0.7 mile and turn left onto Summer Hill Rd. Drive 0.7 mile north on Summer Hill Rd and turn left onto Twilight Dr. Follow Twilight Dr for 0.1 mile and turn right (this is still part of Twilight Dr; it's a loop). Drive 0.2 mile further and turn right onto Lake Dr. Drive 0.3 mile north on Lake Dr and park at the cul-de-sac at the end of the road. 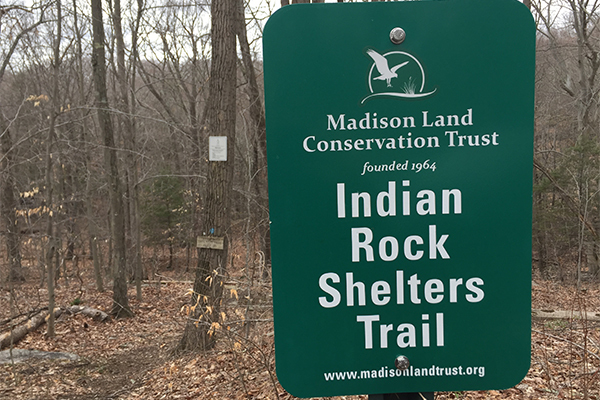 There was a sign here in 2017 for the Indian Rock Shelters Trail. It is perfectly fine to park here and I doubt the area ever gets full of vehicles. To get to North Madison, take CT 80 east from New Haven.